Write a post about 10 of your favorite things. It CAN'T be movies or games, but must be about ten DIFFERENT things. 1) This post will be ten PARAGRAPHS long, one for each of your favorite things. 2) In at least THREE of your paragraphs include a link to another website. 3) Include at least TWO images related to your favorite things (proper attribution please). 4) Make sure you have TAGGED and categorized your post. 5) Use a tool other than writing to tell us about ONE of your favorite things, example: include a video or Voki or audioboo or slideshow – the list is endless. As I am expecting fantastic posts for this, you will have 10 days to do this (you should be able to handle adding one favorite thing per day and explaining that one thing through writing or a web 2.0 tool such as Voki). Next week will be the two games and the final week will be an evaluation of the challenge, so really make a great effort on this post. Please leave a comment on this post when you have finished and published your complete blog post (http://studentchallenge.edublogs.org/2013/04/29/challenge-8-favourites/). The only way the people from the blogging challenge will know if you have completed this activity is if you leave a comment on this post and include the URL of your post. 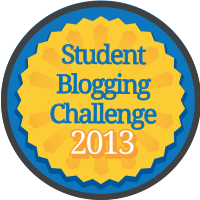 Good luck everyone on this challenge since it will show off to EVERYONE what you are capable of doing using your blog!